The rural counties of Leinster, Munster and Ulster were sparsely populated by Protestant settlers that had been given land in recent plantations. In many places, the Catholic tenants that had previously worked the farms were still in the locality and subsisted as landless outlaws (woodkerne, or tories). When rebellion broke out, some were very quick (and brutal) to exact revenge on their usurpers. Reports of the violence was greatly exaggerated in order to garner financial and military support from London. Many of the troops sent to Ireland, enraged by these reports, were only too keen to reciprocate. The 1641 Rebellion was particularly notorious for the atrocities committed by troops on both sides. Civilians were harshly treated and often executed on the spot. 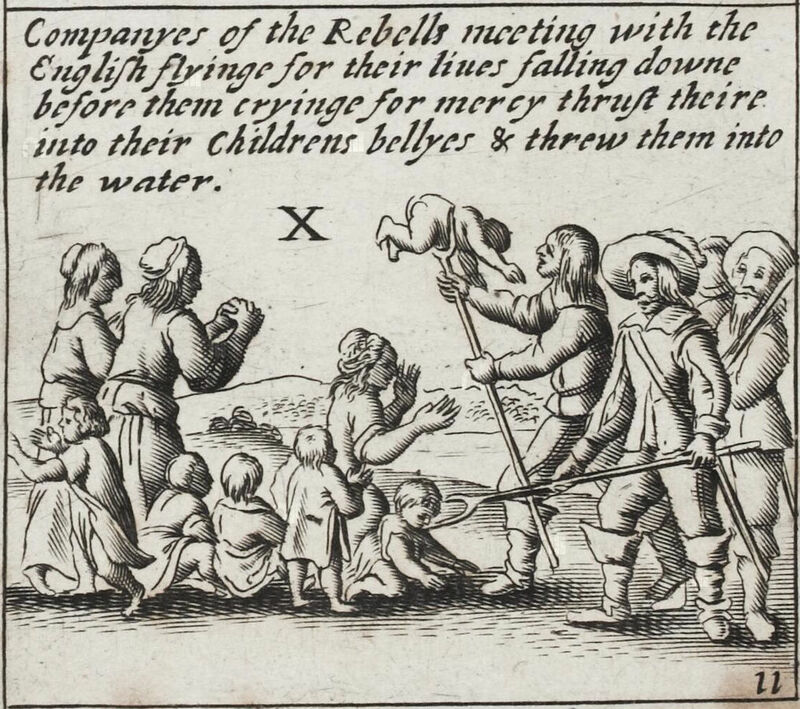 This woodcut, from Ulster, illustrates the general hysteria attributed the the propaganda. The fortified towns of Bandon Bridge and Kinsale were important refuges for Protestant farmers and their families who were fleeing from the armies of the Catholic Confederacy. 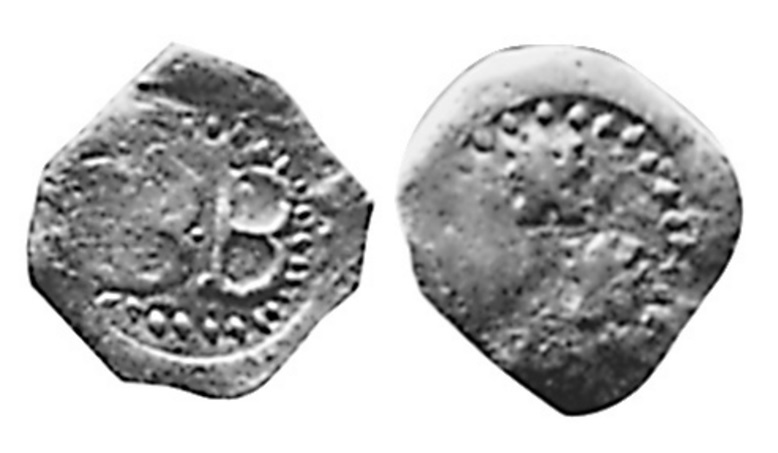 Although the two armies splintered under a variety of commanders, some of their number were left to besiege the so-called Southern Cities of Refuge – Bandon Bridge being one of these. The situation was made even more complex by the splintering of the Protestant armies into those loyal to Parliament, and those loyal to the king – and, in 1649, when Charles I was beheaded, some of the Protestant forces even defected en-masse to the Confederate side. When Cromwell invaded Ireland, another series of defections in either direction occurred. Scans of the original papers, maps and texts from these depositions can be viewed via the Trinity College Dublin website. The 1641 Depositions (Trinity College Dublin, MSS 809-841) are witness testimonies mainly by Protestants, but also by some Catholics, from all social backgrounds, concerning their experiences of the 1641 Irish rebellion. The testimonies document the loss of goods, military activity, and the alleged crimes committed by the Irish insurgents, including assault, stripping, imprisonment and murder. Propagandists, politicians and historians have all exploited the depositions at different times, and the controversy surrounding them has never been satisfactorily resolved. Richard Boyle was appointed Privy Councillor for Ireland in 1613. That same year he bought the lease for the town. At that time Bandon was under constant attack from the conquered natives. As a result, in 1620 Richard Boyle began the construction of a wall around its perimeter. The wall took approximately five years to build and enclosed an area of 27 acres. Most of the walls were nine feet thick and varied in height from thirty to fifty feet. There were six round towers with additional defence provided by cannon. The river openings were protected by iron flood gates and fences. The gates were built within an archway capable of allowing the tallest cart-load to pass through. They were of an imposing kind with beautiful architectural portals and strengthened with portcullises. The bridge was built of stone and consisted of six arches. Within the walls Boyle built 250 houses. There were also three urban tower houses. “my town of Bandon-Bridge is more encompass than Londonderry… my walls are stronger and thicker and higher”. The main town was entirely Protestant (enforced by an early by-law) but suburbs containing Irish households were to appear near the southern part of the town even before the walls were finished. By 1623 the suburb in Cloghmacsimon townland had acquired the self-explanatory name of Irishtown. Things did not stay so geographically definite for long. The ‘census’ of 1659 recorded a population of 846 at Bandon Bridge, 542 English and 304 Irish. The Irish were presumably Catholics, a proof that Boyle’s ban on ‘popish recusants’ was less effective than had been claimed. The plentiful supply of water from the River Bandon and its tributaries provided a basis for the growth of many industrial pursuits. Among the workers recorded in the early seventeenth-century were bakers, blacksmiths, butchers, carpenters, chandlers, cloth workers, comb-makers, coopers, curriers, cutlers, dyers, felt makers, glaziers, glovers, masons, metalmen, pewtermen, shoemakers, strainers, tailors, tanners, turners and weavers. Bandon was one of the best defended settlements in Munster before the 1641 Catholic Rebellion and with its new walls and gatehouses, its own militia and a substantial garrison it was to prove more than a match for its assailants. However, the effects of the rebellion were disastrous for Bandon. Sealed off from the sea, its agricultural hinterland devastated and the town flooded with refugees, it could no longer effectively function as a trading centre. Although it never fell to the Irish Confederates and their allies, it became an enclave in what remained essentially a no man’s land until the arrival of Cromwell.